Not sure what your favorite perfume is? Looking for that one signature scent to complete you, but haven't found it as yet? 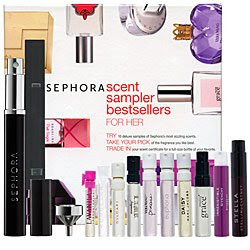 Well then, the Sephora Scent Sampler Best Sellers For Her set is totally up your alley. But that's not all ... it also contains a voucher that lets you get your favorite of the ten fragrances free! Yes, that's right. You pay only $50 at sephora.com, and then you can bring the voucher into any Sephora store and redeem it for your favorite of these amazing fragrances. And since each retails for way more than $50, you're getting such a fabulous deal! The only bad part is deciding which of these ten really calls your name.